A terrific gift for a new baby girl. 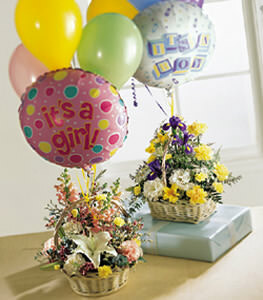 A basket full of flowers is finished with 1 mylar and 3 multi-colored latex balloon in an impressive display. The arrangement includes a white lily, pink snapdragons, white and pink carnations and more. Balloon design may vary.